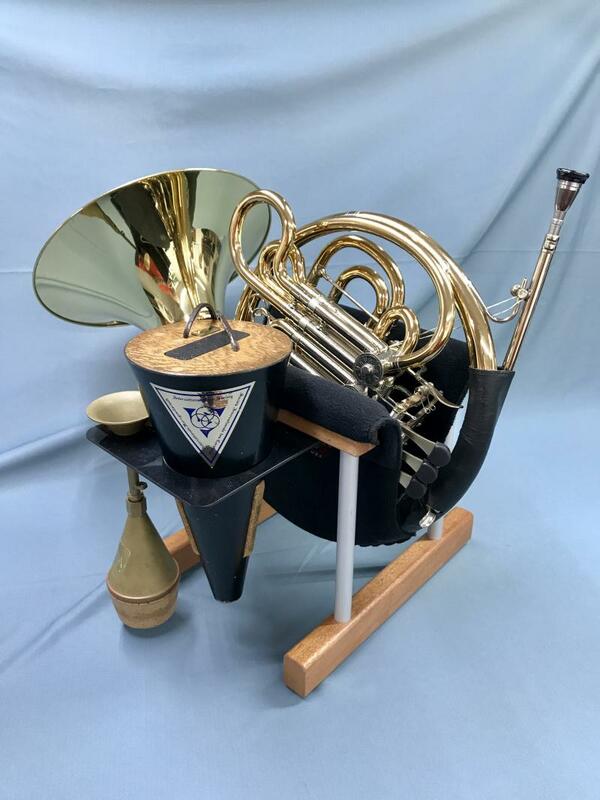 Soft Stands are the finest stands available for horn; safe, secure and attractive. They are easy to disassemble and transport in the handy carrying tote. If you love your horn, you want it to be safe at all times! The mute holder accessory is available for those who like to have their mutes within easy reach to facilitate quick mute changes. The mute holder accessory pictured above is now available for Soft Stands for Horn for only $25.00 US. If you already have a Soft Stand for Horn, we can retrofit your stand with a mute holder for the same price. To order a mute holder accessory use the same button to the right for ordering one stand in the USA. For international orders, send me an email with your request. Not a display stand....Made for everyday use! We are proud to offer you the most well-designed stands for Horns and Wagner Tubas. Our patented (U.S. Patent #7893332) system of support ensures the best protection possible for your valuable instrument. Carefully hand crafted in the USA using wood, aluminum and cloth from American sources. "I found it very helpful and convenient and gentle/soft on my horns." "I've been using it now for the past couple weeks and have gotten used to having it next to me onstage... It is already making my orchestral life that much easier"
"I love my horn stand, and I'm SURE my horn does too! It looks so happy lounging in it! Eric, can you make a 6'4" one for me?" "Your stand is a terrific concept, and brilliantly executed. The vertical, "plate-display" style stands don't work very well. They collapse, stick to the horn when placing it or removing it, possibly denting it in the process. I've heard some guitar stands work okay, but probably need extra padding and customization. My jury-rigged solution (until now) was a trombone stand, holding the horn up by the bell. (If you point one of the legs the same axis as the mouthpipe, it won't tip over.) But the Soft Stand is far more convenient, protective, and easier to use. You just drop the horn in it from its natural holding position...no fussing at all. The design is very clever. Although it doesn't have a cross brace and seems a bit flexible when you just pick it up, this has no effect when in use...the horn in place completely stabilizes it. It's comforting to see your horn cradled in that plush sling...as if a trusted friend is holding it. I'll probably get a few more for all my horns. Great job!" "A brilliant idea and a very worthwhile purchase! I've tried several different types of stand and this is the best so far. My horns can now sit neatly tucked away under the piano instead of on top of it! And safely in its soft stand my horn survived the big earthquake on 11th March, 2011." Copyright Soft Stands, LLC. All rights reserved.